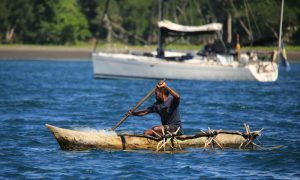 On 17th July 1774, Captain James Cook first “saw land bearing SSW” and decided that “this was the Australia del Espiritu Santo of Quiros or what M. D. Bougainville calls the Great Cyclades.” They had in fact spotted the island of Maewo in what is now known as Vanuatu, previously called the New Hebrides. After making, or attempting landfall on a number of islands, on the 4th August they sailed south towards a large island “…being guided by a great fire we saw upon it,” This island proved to be Tanna, and they shortly realised that the ‘great fire’ they had seen was in fact “a Volcano which threw up vast quantities of fire and smoak and made a rumbling noise which was heard at a great distance.” The volcano was Mt Yasur. After 16 days of fishing and foraging, boat repairs and shooting at the natives, they eventually sailed on the 20th when the wind had veered to the SE. Captain Cook named the bay Port Resolution after the ship, as it was the first ship to have ever anchored in there. On the 11th of July 2017, at 4.30am, CESARINA sailed into Port Resolution in the dark in 3 metre seas and winds gusting 28kts. With almost no chart information on this remote island but aided by GPS waypoints and the anchor lights of those of the fleet who had already arrived, we dodged the reef and also dropped anchor (just the one) in the calm waters of the bay, wrote our logbook entry and tucked ourselves into our seaberth, dog-tired. Later that morning we were woken by the sound of another dinghy coming alongside. On our travels we have often had small boats coming alongside in the mornings when we have been at anchor, usually local people selling fruit, fish or handicrafts. Still somewhat bleary-eyed, I came on deck as our visitors departed and was therefore very confused by the sight of a delivery: a pair of sailing wellies and a Morrisson’s Supermarket bag full of miscellaneous items. The penny dropped after a short while – these were in fact my own sailing wellies from Sumore and other things that I had inadvertently left behind in Panama. Thank you, Stephen, for sending them via the lovely Aurora Polaris. My feet, which have been mostly naked or in sailing shoes for the last 8,500 miles, have never been so happy to see a pair of wellingtons. I doubt that Port Resolution has changed much in the 242 years since Cook christened it. 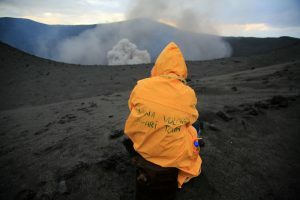 The beautiful bay, bounded by white and black sand beaches and sheer cliffs of lava, is fringed with palm trees against a backdrop of several volcano peaks. 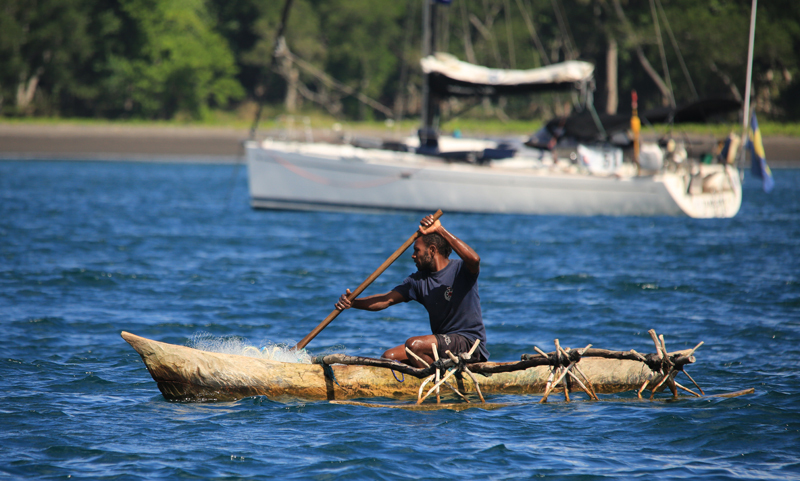 We watched as local men, seemingly fairly oblivious to the several millions of pounds’ worth of yachts now anchored in their fishing spot, paddled around in their outrigger canoes, fishing with nets by hand. I couldn’t help but think that our yachts, massive in comparison to these 8’ dug-outs, were somewhat in the way. A black and white (highly venomous) sea snake swam wriggling past CESARINA. We saw smoke and steam occasionally puffing out from vents in the rocks just above the shoreline and were every so often enveloped in a smell of volcano; a rich, deep smell of burning rock and ash. We sipped coffee in the cockpit and took in our thoroughly unfamiliar surroundings. We had just begun the frankly onerous task of unpacking and inflating our little dinghy when Thomas from HANNA came by in his tender to let us know that we were being hailed by Rally Control to come ashore to see Customs and Immigration. We were the last boat to check in. Oops. He kindly gave us a lift to shore where we were greeted by a dozen curious, grinning children. No need to fire musket shots, clearly. Up the slippery, tree-root ‘steps’ to the top of the hill to the Port Resolution Yacht Club – an open-sided wooden building with a corrugated iron roof. We were thrilled to see Stefano again and to meet Gaelan and Mindy, his two helpers who were new to us. Customs and Immigration was this time an easily conducted affair, with a couple of forms to complete and advice to leave all foods on board. It was all over and done with inside twenty minutes. This is one of the best reasons to travel with the World ARC. Bliss. We then waited for the ‘Bank’ to reopen. The ‘Bank’ today was a booth – normally the bar, presumably – in the corner of the room. Above the booth a piece of paper, roughly A5, had been pinned, with the word ‘Bank’ written in yellow highlighter, outlined in blue biro. The bank employees had gone into the village for lunch, but they would be back soon. Liliane, the lithe and graceful woman with an easy, bright smile in a slightly grubby and faded Sunday dress, charmingly declined to sell us even a can of coke from the Yacht Club bar (the large chest freezer-turned-fridge behind the bar, ie in what was currently serving as the bank) until we had some local money. So we waited. Port Resolution on the island of Tanna – the whole of Vanuatu in fact – is positioned on the Pacific Rim of Fire but also in prime cyclone territory. Vanuatu gets swiped by a cyclone almost every year. Occasionally, the cyclones pass right overhead and then the damage, such as when Cyclone Pam hit in 2015, is catastrophic. Port Resolution was flattened. This is a ‘Kastom’ village, where the traditions are still upheld, where the houses are almost all made from bamboo and local wood with woven pandanus leaf walls and roofs. Water comes from a hand-pump stand pipe in the middle of the village, a gravity-fed water supply from one of the many freshwater springs. There is no road to speak of, just tracks through the volcanic sand and dirt. There is no mains electricity and most power is provided by a handful of solar panels. Apart from the solar panels, it seems that many things have not changed here for a very long time. As we sat in the Yacht Club building waiting for the bank, slowly but surely people from the ARC fleet began to arrive, most of whom we had not seen since January. The feeling of being back in the bosom of the fleet is so precious. 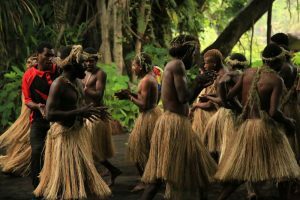 I found the passage to Tanna, while it was rough at times, so much less nerve-wracking because I knew that we had friends nearby who would come to our aid if we had problems. There have been many times in the past few months when we were completely alone in the wild, wide ocean, many hundreds of miles from any shore and out of VHF radio range of any other boat. That’s one of the unnerving things about sailing across the Pacific: there is so little shipping traffic in most places. Sometimes there are fishing boats and occasionally other yachts. We have an EPIRB on board (Emergency Position Indicator Radio Beacon) which we can activate in the event of a major nightmare on board, but it would take a while for anyone to reach us. Days, probably. Now we have a twice-daily check-in on the SSB radio. Underneath our flying trapeze, the net has been restrung. The bank officials finally returned and we changed some money – 400USD became 40,850 Vatu. I had the feeling that was probably a lot of money around here. More of our old fleet-mates arrived and just after 3pm, we set out on a walking tour of the village. My goodness. I would have been extremely uncomfortable with what one of our friends referred to as ‘Social Voyeurism’ if the people from the village had not been so smiley and welcoming. Laughing, giggling children, women with huge smiles, handsome men mostly keeping their distance. Mostly in dirty, tattered clothes with holes in. Mostly without shoes. We wandered past huts with woven walls, a few more robustly-built buildings including the school. The school bell was made from an artillery shell. (The Americans had several bases throughout Vanuatu during the War in the Pacific and they left an enormous amount of hardware behind. Off Million Dollar Point on Efate, they dumped tanks, ammunition, boats, and a myriad other items of war.) We visited the ‘Women’s Shop’ and for the grand total of 2200 vatu (about 22USD) I bought a beautiful piece of sandstone carved to look like a turtle shell, and an intricately woven handbag. Outside, ladies sat in a large circle on the floor selling things to eat. Smoked, dried fish; fried yam patties; sticky, sweet doughnuts; mashed taro wrapped in some kind of edible leaf… For the equivalent of 25p I bought a delicious albeit slightly oily yam patty and 2 very yummy doughnuts. The lady insisted on giving me the correct change. That night we ate with Ros and Howard on their big catamaran MISTO. It was really good to catch up, and also to eat at a proper table! On CESARINA, circumstances dictate that food needs to be eaten with either a fork or a spoon, and from a bowl. Anything else and you will probably end up wearing it. 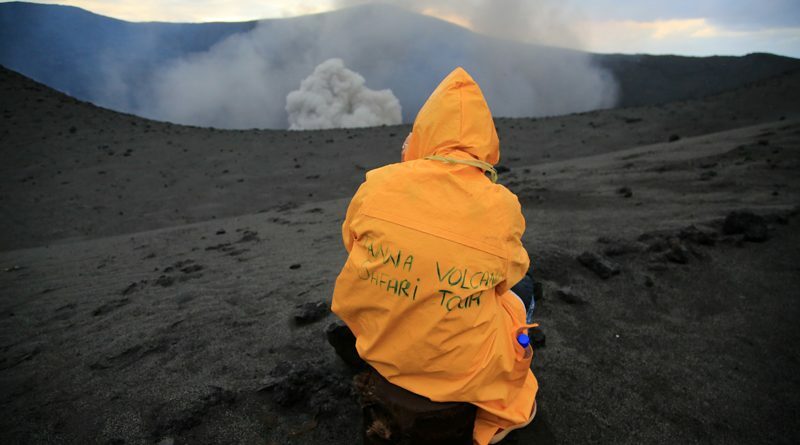 The next day was the day of the Volcano Tour. Holy smokes (literally). We climbed into the back of 4x4s and bounced our way up to the Mt Yasur reception point where we were officially welcomed, in the rain, by local people in traditional grass skirts who looked pretty cold as they waited to dance for us. The earth definitely moved for us as they pounded it with their bare feet and whooped as they wheeled and stamped their welcome. Most people took advantage of the knee-length yellow raincoats provided as part of the tour and back we jumped into our trucks. Wagons roll. We emerged from thick jungle onto a vast dark grey ash plain. A moonscape. The road continued at an alarming angle up onto a flank of the volcano and eventually we parked at the beginning of a footpath up to the rim. It was windy and quite chilly already. We all piled out and began a fairly slow, single-file ascent. At the top, the wind whipped round our ankles. Before us, a giant caldera. Since the guidebooks were written, they have changed the rules here. When some of our group wandered off they were quickly ushered back to the rest of us, looking like bath toys in their long yellow macs in the rain. We were not permitted to climb the higher ridges to our left to stand on the rim and peer over into the bubbling lava. 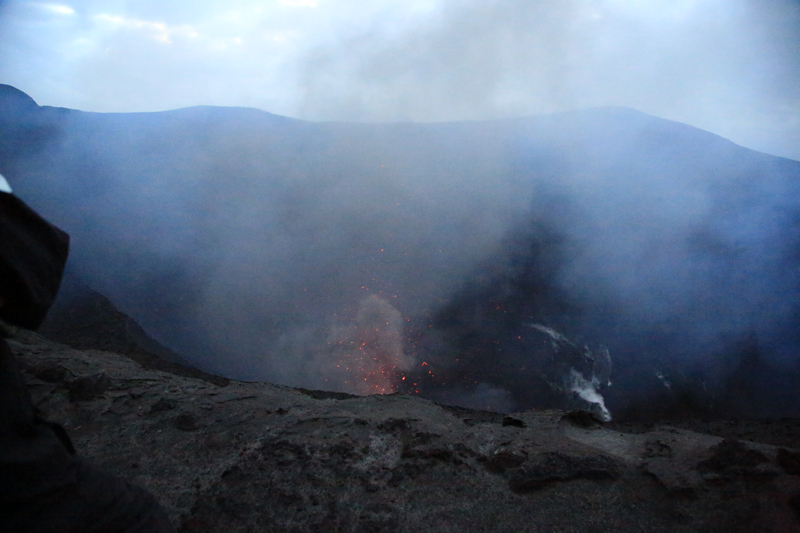 We stood atop the outer rim, maybe 80m from the edge and watched. I didn’t really know what to expect and no number of documentaries and YouTube videos can prepare you for what it is like to experience what came next. First, the shock wave. Your ears know about it first – the pressure is suddenly immense. Then your feet realise that the ground is trembling beneath them. Then your ears again – a deafeningly loud roaring, rushing noise. 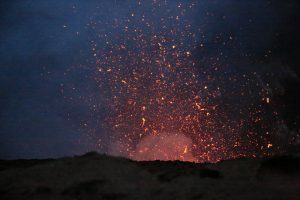 Finally, your eyes register first plumes of steam and smoke, and then the bright red lava, exploding under pressure into the sky, shooting hundreds of feet into the air and splattering back into the crater. Wait five minutes and it all happens again. Sometimes the gap between explosions was a little longer and then the fireworks were even more spectacular. 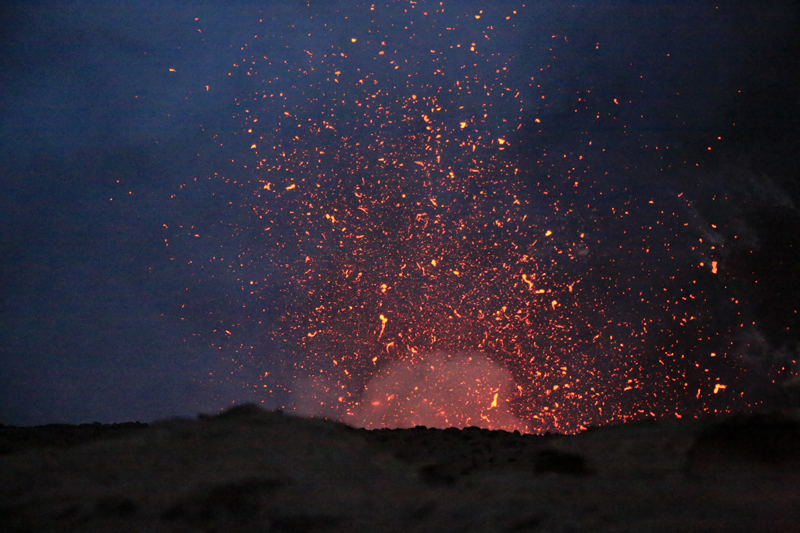 As the sun set behind the volcano and the light fell, the displays seemed to become even more dramatic. The lumps of lava, ejected high into the air, glowed bright red in the sky. Despite the wind and rain lashing us now from behind, you could feel the heat from the bowels of the earth. It was an extraordinary experience. Back in the village and we had supper booked in a village restaurant with half a dozen other sailors from the fleet. We picked our way through the thick darkness of the village, our torches flashing circles of light, and eventually found Leah’s Restaurant. A woven hut with a sand floor, dimly lit with solar lamps; a colourful tablecloth and vases of flowers; our hostess Leah, the aunt of Liliane at the Yacht Club, in a faded, grubby dress. The food took a while to arrive on the table but we had plenty to talk about. Then the curtain to the kitchen was drawn aside and plates began to arrive: yams cooked in coconut milk; today’s catch of fish, freshly fried; a salad that was something like coleslaw; sweet and fleshy pumpkin; sticky plantains; snake beans and choco (christophene) and a handful of other dishes, all arriving one after the other onto the already laden table. It was delicious. Occasionally we heard the rain on the woven roof and saw it running off the sides. We were dry and cosy inside. We eventually said our goodbyes, walked back to the beach, found our dinghies and carefully tuckered our way back across the bay. I leaned over the bow of the boat with my headlamp lighting the water, hoping to avoid some of the rocks and coral heads waiting to puncture our dinghy. Tomorrow would be a big day.